Parks and Recreation Director finalists Kim Lyddene speaks with City Councilor Mike Sykes during a meeting and greet held on April 15. Parks and Recreation Director Finalist Barry Jeskewich speaks with Mayor Sharon Konopa during a meet and greet held April 15. 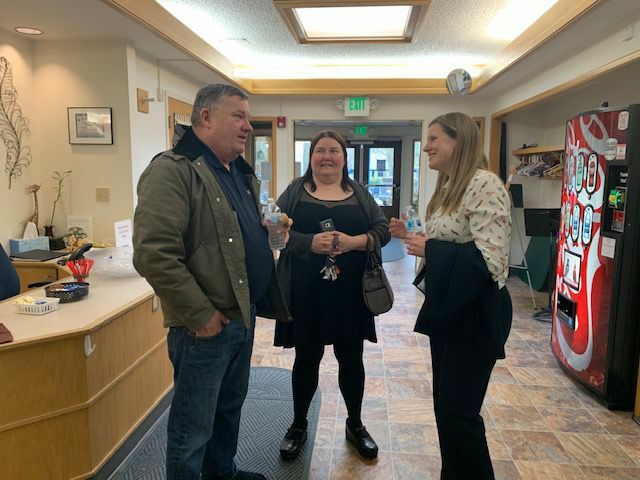 Finalists for the Parks and Recreation Director position met with department employees and the public during a meet and greet event held April 15. Current Director Ed Hodney will leave the position in June. 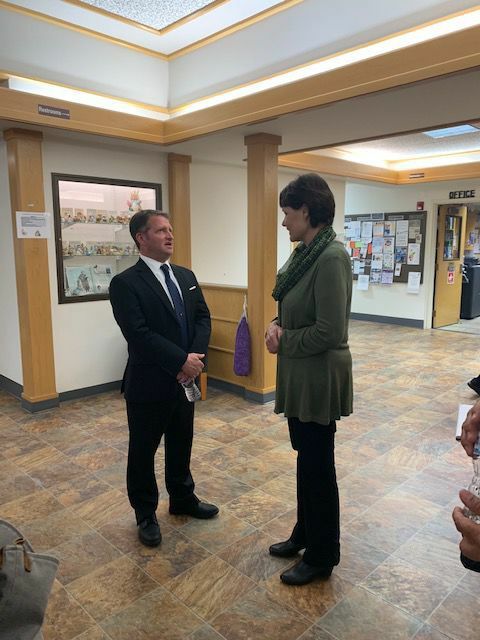 Albany Parks and Recreation staff, the mayor and city councilors and others gathered Monday afternoon at the Albany Senior Center for a meet and greet with the two finalists for the department’s director position following Ed Hodney’s retirement this summer. Finalists Kim Lyddene and Barry Jeskewich answered questions about their backgrounds and what drew them to Albany. The meeting was open to the public. “It feels like a good place to stretch my legs and do meaningful work,” said Lyddene, who interned in Albany before taking her current position as a program manager for special events, outdoor recreation and adult activities for Willamalane Parks and Recreation in Lane County. She’s held the position for nearly eight years but said she was ready to return to Albany. “I just know what a gem of a community this is,” she said. Likewise, Jeskewich said it was the community that attracted him to Albany from Indiana, where he currently serves as the director of Parks and Recreation for the city of Bedford. “It’s the progressive nature of the park system and the community that drew me,” he said. He also noted the diversity of the recreational offerings in Albany, including arts and entertainment to athletics. “There’s something for all demographics, personal interests and ages,” he said. The city conducted 17 video interviews after receiving just over 40 applications for the position. According to the city, those 17 applicants were narrowed to four, but two withdrew their applications. Earlier Monday afternoon, two panels comprised of community members and Parks and Recreation staff had the opportunity to speak with the finalists. City Manager Peter Troeddson will make a decision on the new hire by the end of the week and the new director will start July 1. Hodney has served as the Parks and Recreation director for 16 years and will continue to work with the department on an “as-needed” basis.